Red-cooked pork belly or some people called it Chinese braised pork is one of the most popular dish in many Chinese and Taiwanese household. There are different ways to prepare this dish. You can add different vegetable to accompany this dish, such as, carrot, taro and potato. 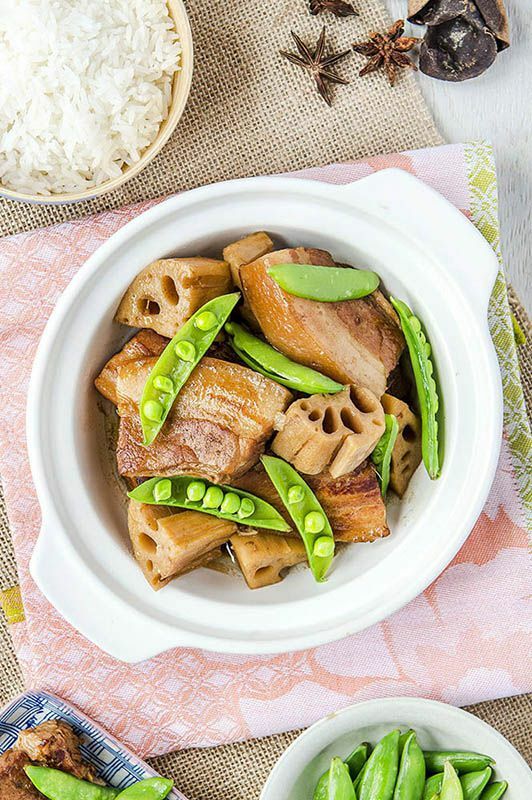 But in this recipe I use lotus root to cook this delicious and hearty pork dish with. People often asked me how to cook different Chinese vegetables and one of the Chinese vegetables they often ask is lotus root. It seems like a lot of people have no idea what to do with this Chinese vegetable. Because this reason, I have introduce different ways to prepare lotus root in my blog and also my cookbooks. Lotus root is a super food in both Chinese medicine and cuisine. Chinese people believe lotus root can improve your digestive system, help blood circulation, improve energy and help with anti-aging and high in fiber. Some Chinese people also believe lotus root juice is very good for getting rid of hangovers. I simply like lotus root just because the taste of it and the texture of it. Nowadays it’s much easier to get hold of lotus root outside of East. You can usually find lotus root in Chinese/Asian supermarket at fresh produce fridge section. You can serve this delicious dish with some hot rice and different kind of green vegetables. I didn’t use a lot of water to cook with this dish, but if you think it’s a little bit dry while cook this dish you can add more water. You can also use a slow cooker to finish cooking this dish but need to take a longer time. For example, high heat for 6 hours, but this is depends on the brand of your slow cooker. Please check with your slow cooker provider or cooking instructions that comes with your slow cooker. Slice pork belly to 1.5 cm thick slice and marinate with light soy sauce and dark soy sauce for at least 30 minutes. Don’t discard the soy sauce left over from marinate the pork. Wash and peel lotus root and slice it into 2 cm thick slice and cut it into quarter. Peel garlic and leave it aside. Heat up 1 tablespoon oil in a frying pan or skillet. Pan fry the pork belly until both side of pork belly is golden brown. Leave it aside. Heat up 1 tablespoon oil in the wok and stir-fry spring onion, ginger, garlics and all the spices until it’s aroma. Add the sugar into step 5 and turn down the fire to medium-low heat and gently stir until the sugar start melting. Once the sugar is melted add the pork belly back in and mix it evenly. So the sugar can coat the pork. Add all the seasonings and the left over soy sauce into step 7. Gently stir it and mix it evenly. Transfer everything from step 8 (pork belly, sauce and spice) to a stock pot and add lotus root and water. Bring it to boil first and let it boil for couple minutes. Then simmer for 1 ½ hours to 2 hours. Add more water if it’s too dry and check it couple times while it’s simmer, just in case the sauce is dry out. If you decided to cut the pork into different shape, for example big cubes, the simmer time might increase. So please be aware of this. *You can garnish with some blanched sugar snap peas or snow peas. Serve with some cooked rice.